Book a camping trip to Chopta that will lead you to a serene campsite where you can practice yoga and meditate in the deep corners of the Himalayas. During the day, surround yourself with snow-peaked mountains and get close to the breathtaking natural beauty of Chopta. You can also participate in a host of adventure activities such as rock climbing, bird watching and guided tours through villages and jungles at an additional cost. At night, gather around a bonfire and have fun under the star-studded Himalayan skies before retreating inside tents equipped to give you a restful night’s sleep. Located at an altitude of 8,200 feet, the campsite is situated near Chopta in the Garhwal Mountains of Uttarakhand. One of the most picturesque destinations for a camping trip, Chopta is often known as the Switzerland of India due to the snow-covered mountain slopes that are a constant feature at the campsite. Placed just 20-km from the town of Ukimath, the campsite offers a chance to spend a relaxing day exploring local destinations and sights. 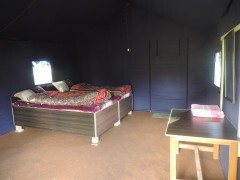 Your will spend the night inside comfortable tents that are equipped with attached washrooms, 24-hr running water and comfortable beds to give you a rejuvenating night’s sleep. 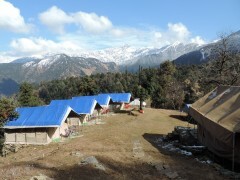 • Camp near Chopta in comfortable tents. • Spend the day admiring views of snow-capped peaks. • Spend the night camping under the starry Himalayan skies. • Choose from a range of adventure activities payable on site. Travellers are required to adhere to the instructions of the tour guide while undertaking any adventure activity during this camping trip in Chopta. Consumption of alcohol and narcotics is strictly prohibited during or before the trip. 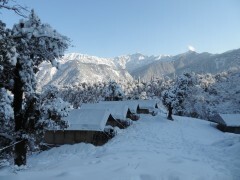 Cancellations made more than 10 days prior to check-in date of camping in Chopta: 100% refund. 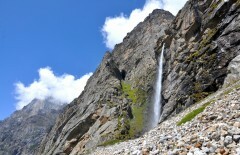 Cancellations made between 10 to 7 days prior to check-in date of camping in Chopta: 80% refund. Cancellations made less than 7 days prior to check-in date of camping in Chopta: No refund. Please note that check-in time for the campsite is 12:00 hrs and check-out time for the campsite is 12:00 hrs. Accommodation for children below 5 years of age without an extra bed is not charged. Accommodation for children between the ages 5 and 10 will be charged at half price. Accommodation for children above the age of 12 will be charged at full price. Participation in adventure activities will require a minimum of 10 participants. A yoga session can be conducted for participants, only if requested a minimum of 7 days prior to check-in date. Day 1 of Camping in Chopta: Check-in and enjoy! Arrive at the campsite by noon where you will be served a refreshing welcome drink. Once you are allotted your tents, spend some time to unpack and rest. You can spend the rest of the day at leisure. Spend some time exploring the scenic delights at the campsite or go on a short walk across camp to admire the snow-capped mountains in the distance. Indulge yourself in some fun camp games like ludo or chess and have fun with your friends or family. You can even try any of the adventure activities such as rock climbing, jungle or bird watching and trekking at an additional cost. Gather around a bonfire at evening and munch on mouth watering snacks. After dinner, retreat back to your tents for a restful night's sleep. Overnight at Chopta in tents. The serene campsite in Chopta. Wake up early to the sound of chirping birds. Enjoy a walk around the campsite or indulge yourself with a session or yoga or meditation. After breakfast, check-out of the campsite and travel to your next destination. Depending on availability, you can even extend your stay. Your trip ends here. Today's meal package includes a full breakfast of a variety of dishes such as aaloo paranthas, omletes, poha, the simple bread toast, daliya and pickle. Check-out time for the campsite is at 12:00 hrs. 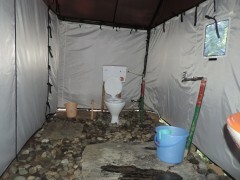 Inside views of the attached washrooms. 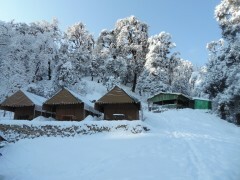 The campsite is accessible via road from Dehradun. You can board a flight to Dehradun's Jolly Grant Airport and embark on a 7-hr road trip to the campsite.